Series 3: 10. All Change! Live-action children's show. 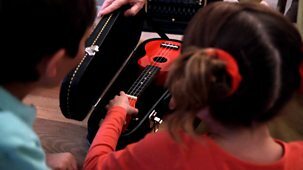 Mr Rosen's friends teach Tim how to play the ukulele when their minibus breaks down outside the house. Live-action children's show. On their way home from nursery school, Topsy and Tim collect lots of sticks. Topsy calls her favourite stick Sticky. Live-action children's show. 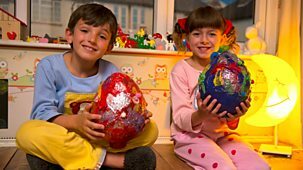 Mummy asks Topsy and Tim to sort their old toys. She wants the twins to give away the ones they don't use any more before they move house. Live-action children's show. Mummy has hurt her arm and missed Topsy and Tim's nursery school play, The Three Little Pigs, but all is not lost! Live-action children's show. Topsy and Tim and their friend Rai show Dad their costumes for the nursery school play. Live-action children's show. 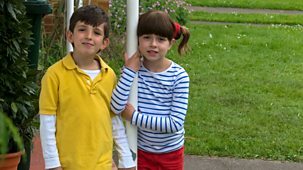 On the day the parts for the nursery school play are announced, Topsy and Tim find out they have nits and can't go to school. Live-action children's show. Tim makes a nest for an egg and puts it in the airing cupboard in the hope that it will hatch into a baby dinosaur. Live-action children's show. Mummy and Dad are going out for dinner and the twins are being looked after by their new babysitter, Danielle. Live-action children's show. 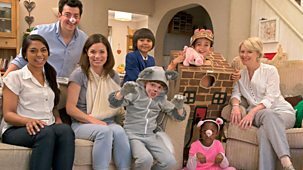 Topsy and Tim enjoy making life-sized cardboard cut-outs of themselves, but milk is accidentally spilled over Tim's cardboard twin. Live-action children's show. 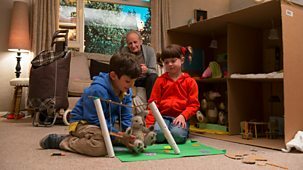 Mr Rosen visits Topsy and Tim and shows them how to make a house from a giant cardboard box. Live-action children's show. 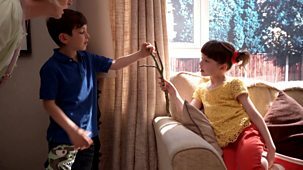 Topsy and Tim enjoy a morning of fun and games with Dad, but grow impatient when they watch him clean the car on his own. Live-action children's show. 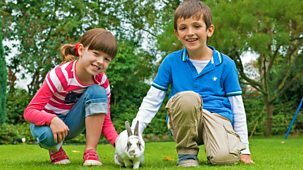 Topsy and Tim love caring for their new pet rabbit but struggle to agree on his name - until they notice his wiggly nose! Live-action children's show. 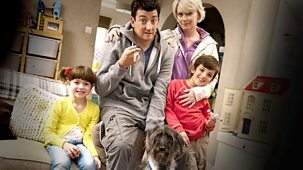 Grandma and Mossy the dog visit Topsy and Tim but when it's time to take them home, Dad cannot find his house keys anywhere. Live-action children's show. Topsy wakes up very early on the morning of the twins' first day at school because she is so excited. Live-action children's show. 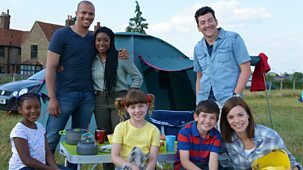 Tony Welch and his mum, Elaine, visit Topsy and Tim with Tony's new baby brother Jack. Live-action children's show. The supermarket delivery brings Vinda's birthday card and present but no wrapping paper.